حقوق بشر زنان یکی از موضوعات کلیدی در چارچوب نظام حقوق بین­الملل بشر است؛ تا کنون اسناد و معاهدات بین­المللی متعددی در حوزه‌ی حقوق بشر زنان به تصویب رسیده و نهادها و سازمان­های متکثری در این حوزه در جنبه­های مختلف به نقش‌آفرینی در عرصه‌ی جامعه‌ی بین­المللی می­پردازند. سازمان­های بین­المللی در راستای اعمال نظارت بر تحقق حقوق بشر زنان در سراسر جهان کارکردهای متنوعی دارند. یکی از مهم­ترین این کارکردها، صلاحیت تفسیری است که در عمل به توسیع مفاهیم و در نتیجه گسترش قلمرو تعهدات دولت­های عضو معاهدات حقوق بشری، منجر می­شود. از جمله مفاهیم و مصادیق حقوق بشر که در پرتو نظریات تفسیری این نهادها، توسیع پیدا کرده است «منع تبعیض»، «برابری جنسیتی»، «حق سلامت»، «کلیشه‌های جنسیتی» و «حقوق جنسی و باروری» است. با توجه به عضویت دولت جمهوری اسلامی ایران در برخی از اسناد حقوق بشری همچون میثاق بین­المللی حقوق اقتصادی، اجتماعی و فرهنگی، میثاق حقوق مدنی و سیاسی و کنوانسیون حقوق کودک، آگاهی از آخرین تفاسیر نهادهای نظارتی بر این معاهدات می­تواند برای اتخاذ مواضع صحیح، مفید واقع شود. فلسفی، هدایت الله 1379.حقوق بین­الملل معاهدات، تهران، فرهنگ نشر نو. هستر میر، هولگر 1390. حقوق بشر و سازمان جهانی تجارت (اختراعات و دسترسی به دارو)، ترجمه‌ی هاله حسینی اکبرنژاد و حوریه حسینی اکبرنژاد، تهران، مؤسسه مطالعات و پژوهش های حقوقی شهر دانش. زایدل، آیگناتس و هومن فلدرمن 1385. حقوق بین‌الملل اقتصادی، ‌ترجمه‌ی سید قاسم زمانی، تهران، مؤسسه مطالعات و پژوهش‌های حقوقی شهر دانش. شهبازی، آرامش «قانون اساسی جامعۀ بین‌المللی در محتق (تأملی در نظریه و رویه)»، مجله حقوقی بین‌المللی، ش46، (1391). 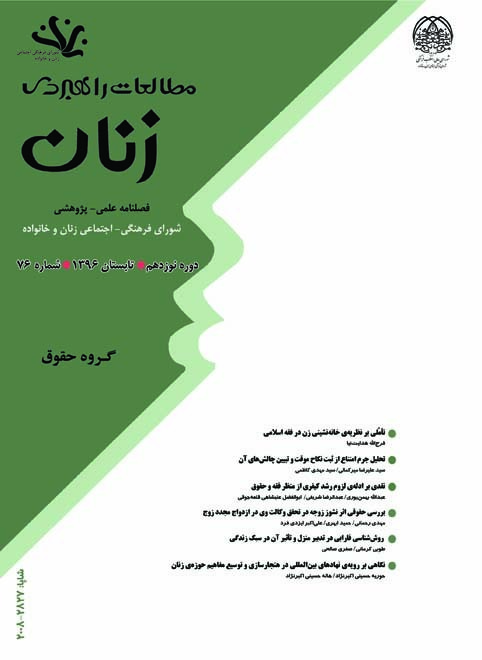 زمانی، سید قاسم 1392. جامعه بین­المللی و حقوق بین­الملل در قرن 21 (مجموعه مقالات اهدایی به استاد دکتر محمدرضا ضیایی بیگدلی)، تهران، موسسه مطالعات و پژوهش­های حقوقی شهر دانش. Ø Bird, Annie, “Third State Responsibility for Human Rights Violations”, European Journal of International Law, Vol. 21 No. 4, (2010). Ø Broude Tomer and Yuval Shany (eds), 2011, Multi-Sourced Equivalent Norms in International Law. Oxford, Hart Publishing. Ø Cassese Antonio & Joseph Weiler (eds. ), 1988, Change and Stability in International Law-Making, Berlin, De Gruyter. Ø CESCR, General Comment No. 14, The Right to the Highest Attainable Standard of Health (art 12), UN Doc.E/C.12/2000/4. Ø Concluding observations on the combined third and fourth periodic reports of the Islamic Republic of Iran, CRC/C/IRN/CO/3-4, and 14 March 2016. Ø egality of the Use by a State of Nuclear Weapons in Armed Conflict, Judge Weeramantry (dissenting op. ), ICJ, Rep. (1996). Ø Egan, Suzanne, “Strengthening the United Nations Human Rights Treaty Body System”, Human Rights Law Review, Vol. 13, No. 2, (2013). Ø Fassbender, Bardo (ed. ), 2011, Securing Human Rights: Achievements and Challenges of the UN Security Council, Oxford: Oxford Scholarship Online. Ø Hernandez, Gleider I. “A Reluctant Guardian: the International Court of Justice and the Concept of ‘International Community’”, the British Yearbook of International Law, Vol. 83 No. 1, (2013). Ø Jennings R and A Watts, 1992, Oppenheim’s International Law. Volume I: Peace, Oxford, Oxford University Press, ninth Ed. Ø Joint general recommendation No. 31 of the Committee on the Elimination of Discrimination against Women/general comment No. 18 of the Committee on the Rights of the Child on harmful practices, 2014. Ø Kamminga, M. T., 1992, Inter-State Accountability for Violations of Human Rights, Philadelphia, University of Pennsylvania Press. Ø Meron, T., 2005, the Humanization of International Law, Leiden: Martinus Nijhoff. Ø Office of the United Nations High Commissioner for Human Rights, Strengthening the United Nations Human Rights Treaty Body System: A report by the United Nations High Commissioner for Human Rights, Navanethem Pillay, 26 June 2012, A/66/860 (‘the UNHCHR Report’ or ‘the Report’), available at: http://www2.ohchr.org/english/bodies/HRTD/ [last accessed 16 January 2013]. Ø Orakhelashvili, Alexander, “Restrictive Interpretation of Human Rights Traties in the Recent Jurisprudence of the European Court of Human Rights”, European Journal of International Law, Vol. 14, No. 3, (2003). Ø Simma, B. and P. Alston, "The Sources of Human Rights Law: Custom, Jus Cogens, and General Principles", Australian Year book of International Law, Vol. 12, (1988-9). Ø Smet, Stijn. “Conflicts between Absolute Rights: A Reply to Steven Greer”, Human Rights Law Review, Vol. 13, No. 3, (2013). Ø Steiner, HJ and P Alston, 1996, International Human Rights in Context: Law, Politics, and Morals Oxford: Clarendon Press. Ø Tomuschat, Christian and Jean-Marc Thouvenin (eds), 2006, The Fundamental Rules of the International Legal Order: Jus Cogens and Obligations Erga Omnes, Leiden,Martinus Nijhoff. Ø Tomuschat, C, “International Law: Ensuring the Survival of Mankind on the Eve of a New Century. General Course on Public International Law”, Recueil Des Cours/Collected Courses, No. 281, Vol. 9, (1999). Ø White, Nigel. "The United Nations System: Conference, Contract of Constitutional Order?” Singapore Journal of International and Comparative Law, Vol. 4, (2000).